Note: Customizable for any age no matter which age is listed! 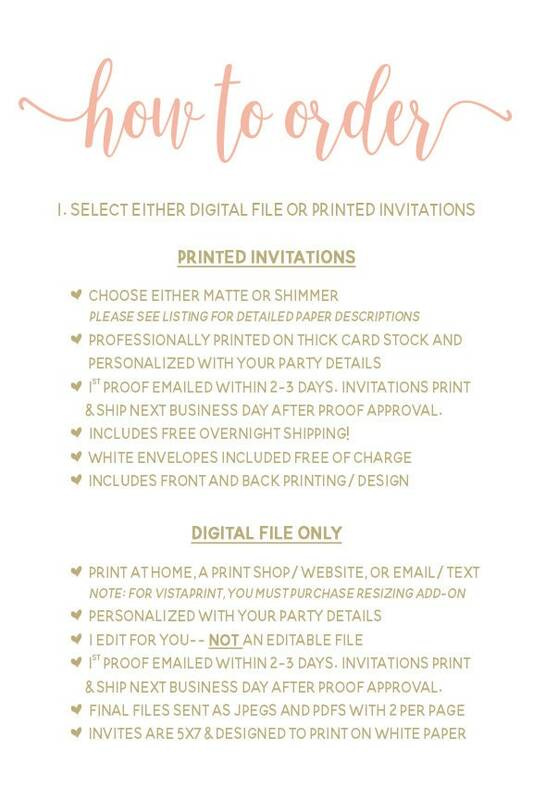 Purchase printed invitations or a digital file! Simply use the drop-down menu to choose. Both options include a FREE matching back for your invitation, for an elegant and polished look. • Email address (please include the email address where you would like your invitation file/proof sent; if no email address is provided, invitations will be sent to the email on file with Etsy). Please note that foil/glitter invitations are NOT real foil or glitter. These invitations use high-resolution effects designed to look like foil/glitter and can be printed like normal. 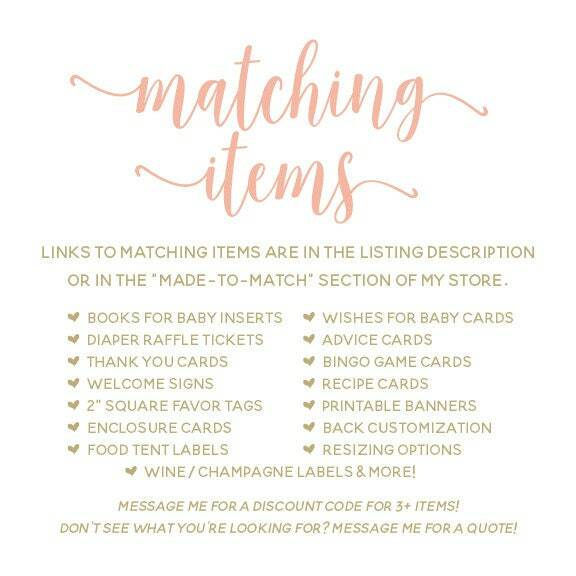 For coordinating items, please visit my “Made-to-Match” section: https://www.etsy.com/shop/CasaConfetti?ref=hdr_shop_menu§ion_id=18513363. • Turnaround: 1st proof emailed within 2-3 days. Invitations print & ship next business day after proof approval. • Includes free overnight shipping! • Please convo me on Etsy if you need a quantity that is not listed in the drop-down menu. Note: Invitations are sent to the printer immediately after final proof approval, and no changes can be accommodated after that point. Please check all proofs CAREFULLY! Reprints are available for 20% off original price. (1) Two high resolution PDFs (one file each for front and back), with two images per page. When you print, each 8.5”x11” sheet of card stock or paper will yield two invitations. Invitations come with ⅛” bleed around the edges and trim marks. Use the PDF files when printing on your own or at your local print shop. For best results, print on white card stock, 110-lb or greater. (2) Two high resolution, single-image JPEGs (one each for front and back). Invitations come with ⅛” bleed around the edge. Use the JPEG files for best results when uploading to a website for printing, or to send as email/evite/text. Invitations are 5”x7” (when trimmed). Designed for standard A7 envelopes. Once you approve the proofs (three free revisions included with each invitation), your print-ready, high-resolution files will be emailed to you. There is a $5 change fee for any changes AFTER the final proof has been approved and the final files have been sent. Don't see exactly what you are looking for? Convo me and I will create something just for you! MATTE: The thickest option, Matte is an ultra-thick 130-lb card stock with a soft, rich finish. This is as high-quality and luxurious as it gets! SHIMMER: An ultra-feminine and luxurious option with a pearlescent finish. Shimmer paper is an ultra-thick 130 lbs and adds a nice, subtle shimmer to your design. 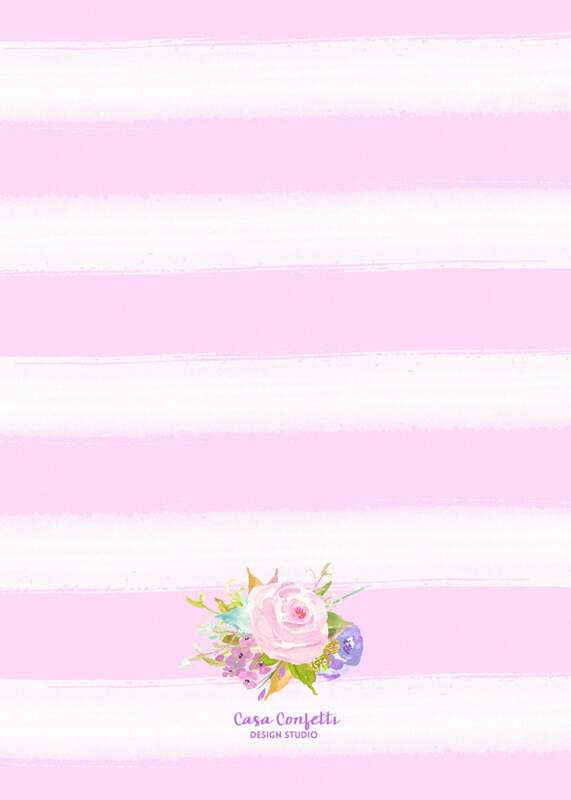 Super girly and great with glittery and gold designs! Note: Unfortunately, I am currently unable to ship printed invitations outside of the U.S.A. But I am happy to work with you on a digital file that you can print yourself! Invitations are sent to the printer immediately after final proof approval, and no changes can be accommodated after that point. Please check all proofs CAREFULLY! Reprints are available for 20% off original price. For digital invitations, there is a $5 change fee for any changes AFTER the final proof has been approved and the final files have been sent. Invitations ship the next business day after final approval of your proof. 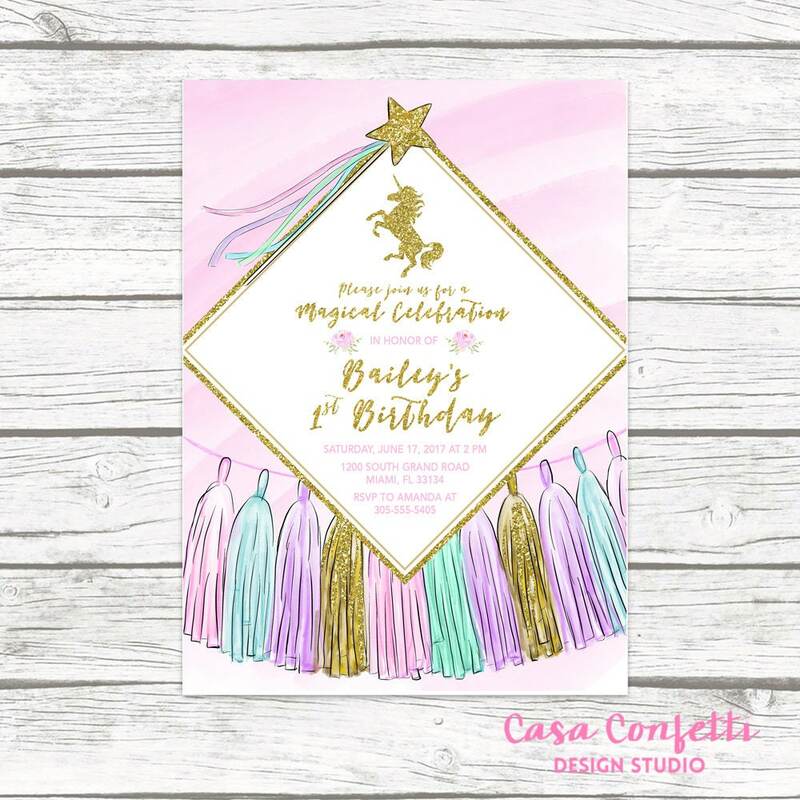 FREE UPS overnight shipping is included with all printed invitations! I want all of my customers to be 100% happy with their orders -- if you do have an issue with your order, please contact me ASAP and I will work with you to fix it! Thanks and I look forward to working with you to make your party perfect! I accept credit cards and PayPal. Production of your order will begin once payment has been received in full. • Instant Download items are available for download immediately after payment clears. You download directly from Etsy and will receive an email from Etsy when your files are ready. • Printed invitations ship next business day and include FREE OVERNIGHT SHIPPING-- get them in as little as 48 hours from ordering! • All designs are high resolution, top quality. Please note that foil/glitter invitations are NOT real foil or glitter. These invitations use high-resolution effects designed to look like foil/glitter, at a fraction of the price. I suggest printing professionally for the most realistic results. 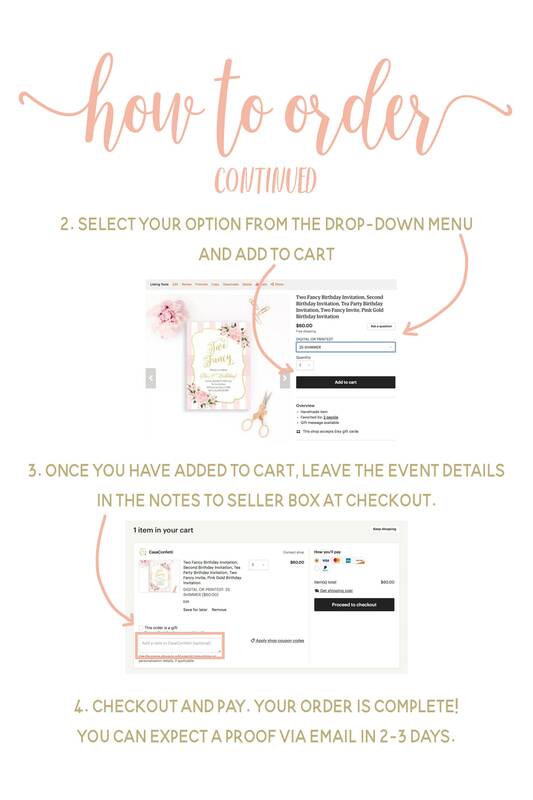 Please select whether you would like a printable digital file or printed invitations in the drop-down menu, and then enter your information (name, date/time, address, RSVP, and registry info if applicable), in the Notes to Seller box at checkout. First proof will be emailed within 48 hours. 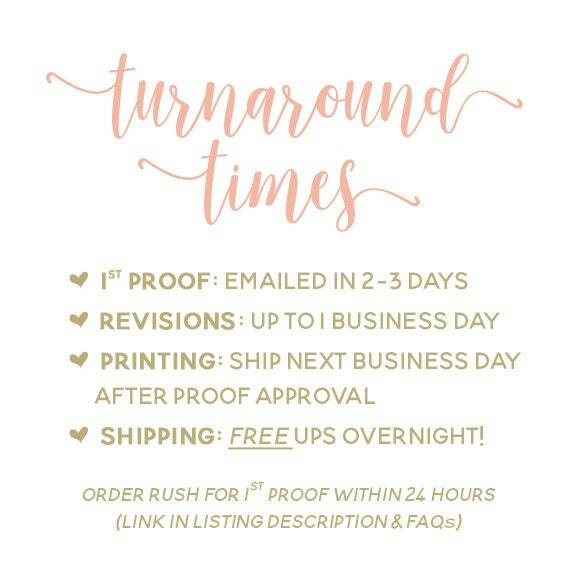 RUSH orders are available for $10 extra, and proof will be delivered within 24 hours -- simply purchase this listing in addition to the invitation: https://www.etsy.com/listing/467447990/rush-order-first-proof-within-24-hours?ref=shop_home_active_1. If you need an invitation sooner than that, please convo me before ordering. 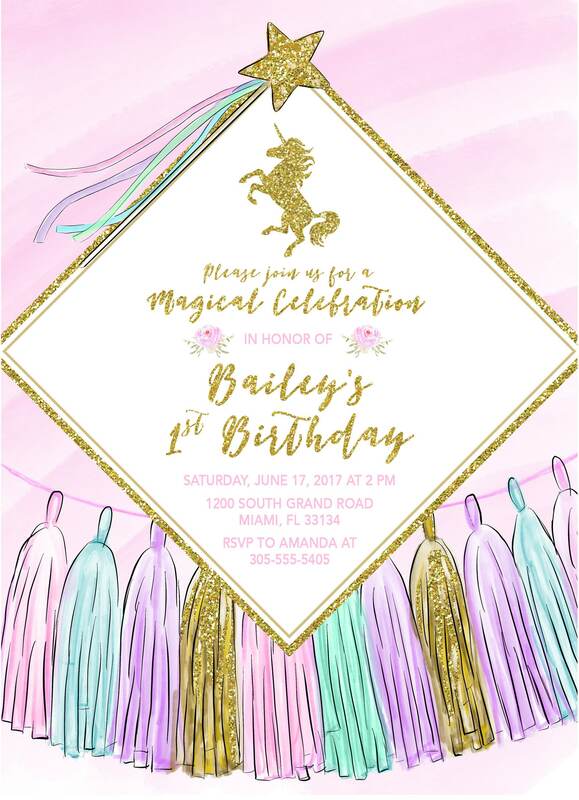 Printed invitations ship via UPS the following business day after final proof approval (please allow 2-5 business days for delivery per UPS shipping times). How soon will I receive printed invitations? What is the difference between paper types for printed invitations? Signature is the thickest option (130-lb paper, which is usually reserved for fine stationery) with a matte finish. Shimmer has a similar weight and has a pearlescent finish. Standard is 110-lb cardstock and has a smooth, bright white finish. For everything except instant download items, yes. Most wording change requests can be accommodated without additional charge, but those requiring a large amount of reformatting will incur a fee. Please contact me beforehand to double-check. For instant download items, please refer to the last question on the page. Can I make my invitation Spanish? Can I make my invitation 4x6 instead? Can I upload to Vistaprint? Can I edit instant download items? Instant download items are not editable after purchase. If you would like an instant download item edited please contact me BEFORE purchase. Additional charges will apply, and in some cases, the change cannot be accommodated.